In a strong field, Subiaco are joined by the West Coast Eagles and West Coast Fever as the finalists for this coveted award. 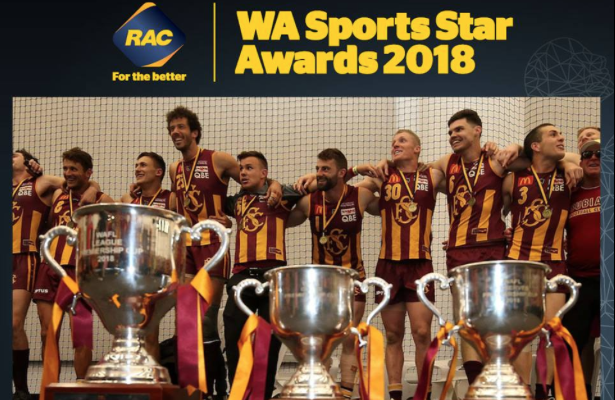 In the over 35 year history of the WA Sports Team of the Year award, no team that competes in a state level competition has won the award, meaning Subiaco would need to create history to beat both the Eagles and Fever who compete at the national scale. However after what was regarded as the greatest season by a single club in the over 130 year history of the WAFL, Subiaco are in with a strong case of claiming this unprecedented award. The winning team of the three nominees will be announced at the WA Sports Star Awards Gala Night this coming Thursday, February 7 at Optus Stadium. There have previously only been four winners of this award from an Australian Rules team, with West Coast having won the award three times in 1992, 1994 and 2006 while the WA State Football Team took out the award in 1984. The winner of this year’s award will end the two year reign as the Perth Wildcats as WA’s top sports team, with the Wildcats winners in both 2016 and 2017. The Subiaco Football Club is humbled to be a nominee for this award and looks forward to the winner being announced on Thursday night.